View of the Brown+Storey Architects' proposed Public Scaffold. 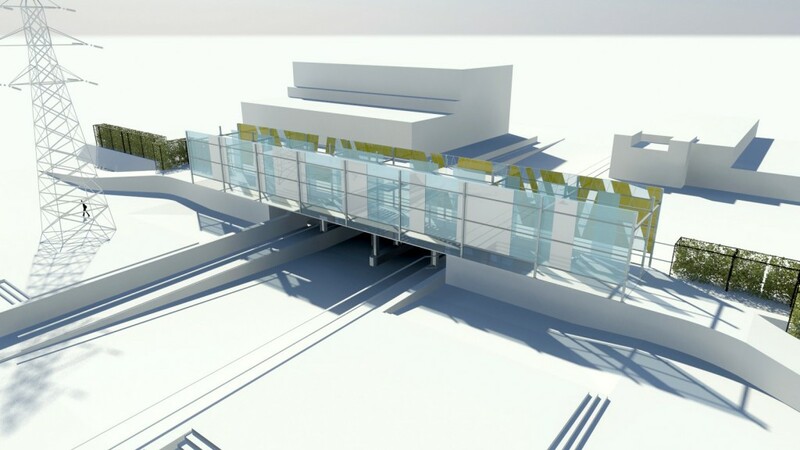 A rendered view through the length of the scaffold, which would bridge the proposed Green Line multi-use trail across local road underpasses like the pilot location at Dovercourt Road. A bird's eye view of Brown+Storey Architects' winning Public Scaffold entry in the Green Line competition. Detail of the panels on the reverse, rail-facing side of the Public Scaffold. 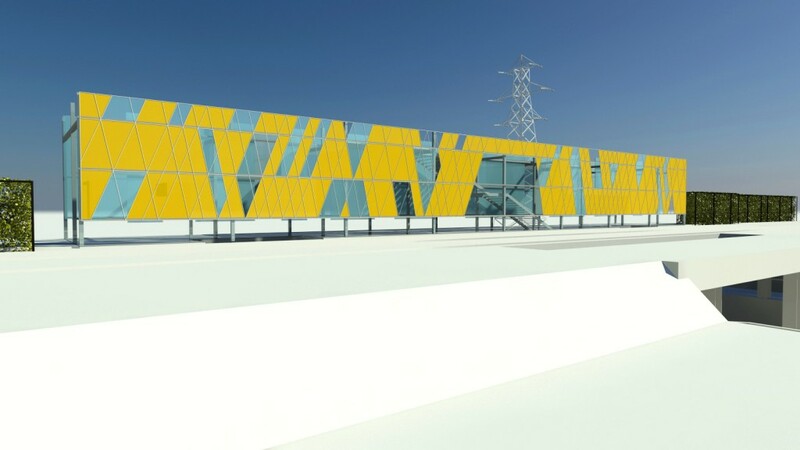 These panels could include solar-collecting technologies to power lighting and public amenities at ground-level. 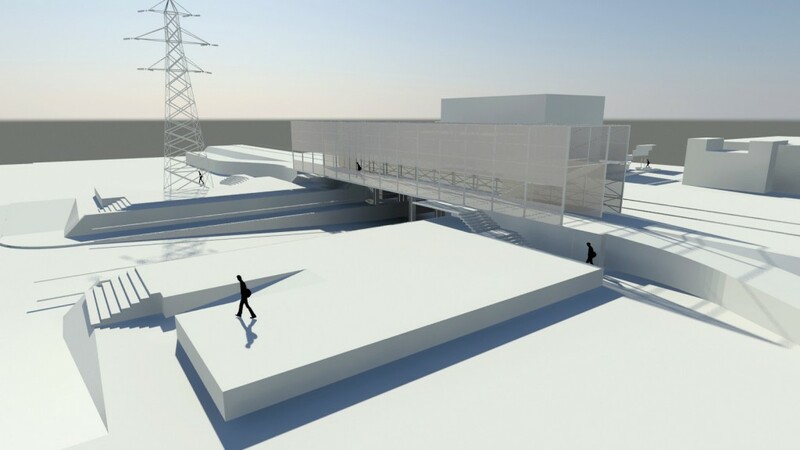 Several plinths, ramps and stairs would mediate the scaffold's connection to road and path on each side of the underpass, providing multiple access routes between upper and lower levels. 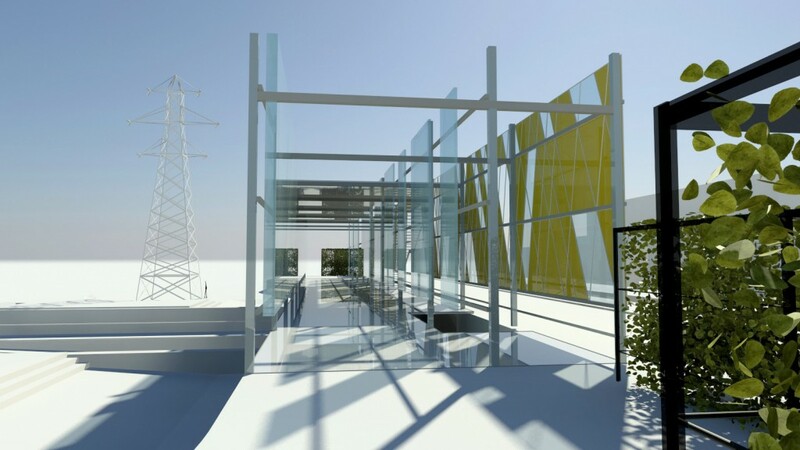 The scaffold concept provides both shelter and openness across an inhospitable road underpass. 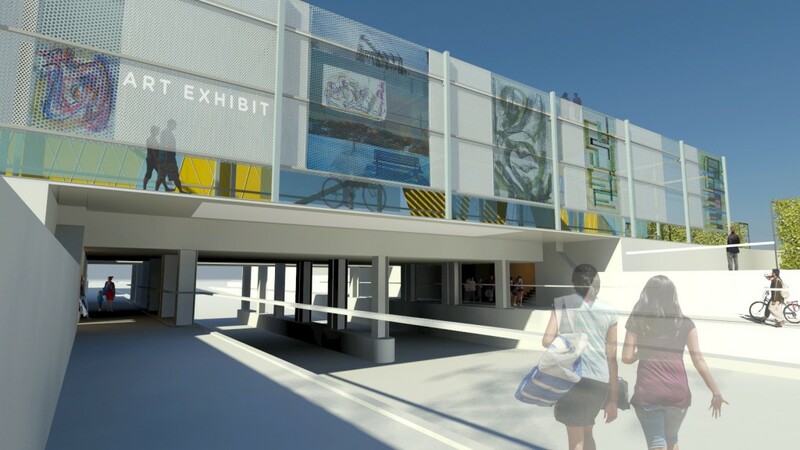 Our winning entry in the Green Line’s Underpass Redesign Competition sought to match the new social character of the anticipated park with a solution to the underpass that would activate the public realm and safely link the street, bridge and gardens. 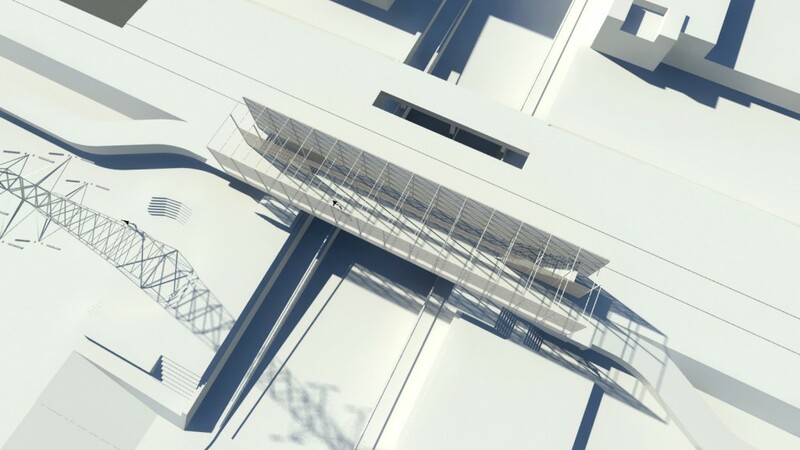 To bring a continuous cycling and pedestrian pathway across the underpasses that dominate the Green Line, we proposed cantilevered pedestrian bridging alongside the railway bridge structures. Over the new bridge, an ephemeral scaffold is constructed with a glass framework, built high enough to form both a generous sheltered route and a look-out. The scaffold construction provides a kiosk and storage space for bikes. Its glass skin becomes a solar collector and lamp on the south side, and a surface for art, community notices, dialogues and paid messaging on the north side. In addition to the ramps from the Green Line, wide, safe public stairs connect the street to the scaffold passage. The importance of these stairs is underlined by proximity to new ‘Exchange Plazas’ at street level on each side of the bridge. These hard surface plazas are raised plinths that punctuate the street and multi-use path. These plazas, together with the scaffolding, create new landmarks in the city – new public spaces, cycling and skateboard friendly, linked directly to the Green Line with constructed hedges, light, space, resting places, and a variety of amenities. The new Dovercourt Exchange becomes a pluralistic landmark for passage east and west, north and south, up and down and across. Competition B of the Green Line Ideas Competition solicited proposals for the redesign of the underpass carrying Dovercourt Road beneath the railway corridor, as a model for carrying the future Green Line safely across the 9 road underpasses the linear park will eventually have to cross.